The uppertail and undertail coverts cover the base of the tail feathers above and below. Sometimes these coverts are more specialised. The "tail" of a peacock is made of very elongated uppertail coverts. 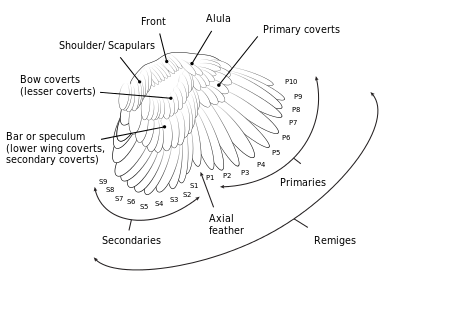 The upperwing coverts fall into two groups: those on the inner wing, which overlay the secondary flight feathers, known as the secondary coverts, and those on the outerwing, which overlay the primary flight feathers, the primary coverts. Within each group, the feathers form a number of rows. The feathers of the outermost, largest, row are termed greater (primary-/secondary-) coverts; those in the next row are the median (primary-/secondary-) coverts, and any remaining rows are termed lesser (primary-/secondary-) coverts. The underwing has corresponding sets of coverts (the names upperwing coverts and underwing coverts are used to distinguish the corresponding sets). In addition, the front edge of the wing is covered with a group of feathers called the marginal coverts. Within each group of wing coverts, the rows of feathers overlap each other like roof tiles (the greater coverts are overlain by the median coverts, which in turn are overlain by the outermost row of lesser coverts, and so on). This page was last edited on 9 June 2018, at 18:52 (UTC).